Modern cables are typically about 25 millimetres (0.98 in) in diameter and weigh around 1.4 kilograms per metre (0.4 lb/ft) for the deep-sea sections which comprise the majority of the run, although larger and heavier cables are used for shallow-water sections near shore. Submarine cables connected all the world's continents except Antarctica when Java was connected to Darwin, Northern Territory, Australia in 1871 in anticipation of the completion of the Australian Overland Telegraph Line in 1872 connecting to Adelaide, South Australia and thence to the rest of Australia. In 1858 the Steamship 'Elba' was used to lay a Telegraph cable from Jersey to Guernsey, on to Alderney and then to Weymouth The cable being completed successfully in September of that year. Problems soon developed with eleven breaks occurring by 1860 due to storms, tidal and sand movements and wear on rocks. A report to the Institution of Civil Engineers in 1860 set out the problems to assist in future cable laying operations. The submarine cables were an economic boon to trading companies because owners of ships could communicate with captains when they reached their destination on the other side of the ocean and even give directions as to where to go next to pick up more cargo based on reported pricing and supply information. The British government had obvious uses for the cables in maintaining administrative communications with governors throughout its empire, as well as in engaging other nations diplomatically and communicating with its military units in wartime. The geographic location of British territory was also an advantage as it included both Ireland on the east side of the Atlantic ocean and Newfoundland in North America on the west side, making for the shortest route across the ocean, which reduced costs significantly. Eastern Telegraph Company network in 1901. 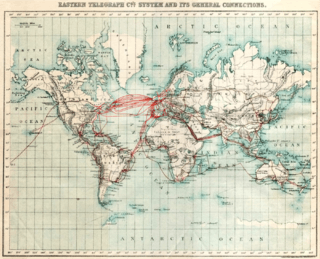 Dotted lines across the Pacific indicate then-planned cables laid in 1902-03. 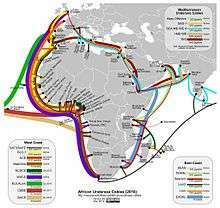 Throughout the 1860s and 70's, British cable expanded eastward, into the Mediterranean Sea and the Indian Ocean. An 1863 cable to Bombay, India (now Mumbai) provided a crucial link to Saudi Arabia. In 1870, Bombay was linked to London via submarine cable in a combined operation by four cable companies, at the behest of the British Government. In 1872, these four companies were combined to form the mammoth globespanning Eastern Telegraph Company, owned by John Pender. 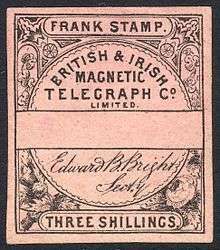 A spin-off from Eastern Telegraph Company was a second sister company, the Eastern Extension, China and Australasia Telegraph Company, commonly known simply as "the Extension". In 1872, Australia was linked by cable to Bombay via Singapore and China and in 1876, the cable linked the British Empire from London to New Zealand. The first trans-pacific telephone cable was laid from Hawaii to Japan in 1964, with an extension from Guam to The Philippines. In 1991, the North Pacific Cable system was the first regenerative (repeatered) system to completely cross the Pacific from the US mainland to Japan. The US portion of NPC was manufactured in Portland, Oregon, from 1989 to 1991 at STC Submarine Systems, and later Alcatel Submarine Networks. The system was laid by Cable & Wireless Marine on the CS Cable Venture. Switching and all-by-sea routing commonly increases the distance and thus the round trip latency by more than 50%. For example, the round trip delay (RTD) or latency of the fastest transatlantic connections is under 60 ms, close to the theoretical maximum for an all-sea route. While in theory, a great circle route between London and New York City is only 5,600 km (3,500 mi), this requires several land masses (Ireland, Newfoundland, Prince Edward Island and the isthmus connecting New Brunswick to Nova Scotia) to be traversed, as well as the extremely tidal Bay of Fundy and a land route along Massachusetts' north shore from Gloucester to Boston and through fairly built up areas to Manhattan itself. In theory, using this partly land route could result in round trip times below 40 ms, not counting switching (which is the speed of light minimum). Along routes with less land in the way, speeds can approach speed of light minimums in the long term. As of 2006, overseas satellite links accounted for only 1 percent of international traffic, while the remainder was carried by undersea cable. The reliability of submarine cables is high, especially when (as noted above) multiple paths are available in the event of a cable break. Also, the total carrying capacity of submarine cables is in the terabits per second, while satellites typically offer only 1000 megabits per second and display higher latency. However, a typical multi-terabit, transoceanic submarine cable system costs several hundred million dollars to construct. Antarctica is the only continent yet to be reached by a submarine telecommunications cable. All phone, video, and e-mail traffic must be relayed to the rest of the world via satellite links that have limited availability and capacity. Bases on the continent itself are able to communicate with one another via radio, but this is only a local network. To be a viable alternative, a fiber-optic cable would have to be able to withstand temperatures of −80˚ C as well as massive strain from ice flowing up to 10 meters per year. Thus, plugging into the larger Internet backbone with the high bandwidth afforded by fiber-optic cable is still an as yet infeasible economic and technical challenge in the Antarctic. Cables can be broken by fishing trawlers, anchors, earthquakes, turbidity currents, and even shark bites. Based on surveying breaks in the Atlantic Ocean and the Caribbean Sea, it was found that between 1959 and 1996, fewer than 9% were due to natural events. In response to this threat to the communications network, the practice of cable burial has developed. The average incidence of cable faults was 3.7 per 1,000 km (620 mi) per year from 1959 to 1979. That rate was reduced to 0.44 faults per 1000 km per year after 1985, due to widespread burial of cable starting in 1980. Still, cable breaks are by no means a thing of the past, with more than 50 repairs a year in the Atlantic alone, and significant breaks in 2006, 2008, and 2009. In April 2010, the undersea cable SEA-ME-WE 4 was under an outage. The South East Asia–Middle East–Western Europe 4 (SEA-ME-WE 4) submarine communications cable system, which connects South East Asia and Europe, was reportedly cut in three places, off Palermo, Italy. ↑ "How Submarine Cables are Made, Laid, Operated and Repaired"
↑ "The internet's undersea world" – annotated image, The Guardian. ↑ Anton A. Huurdeman, The Worldwide History of Telecommunications, pp. 136-140, John Wiley & Sons, 2003 ISBN 0471205052. ↑ Heroes of the Telegraph – Chapter III. – Samuel Morse Archived April 14, 2013, at the Wayback Machine. ↑ Brett, John Watkins (March 18, 1857). "On the Submarine Telegraph". Royal Institution of Great Britain: Proceedings (transcript). II, 1854-1858. Retrieved 17 May 2013. ↑ Jonathan Reed Winkler, Nexus: Strategic Communications and American Security in World War I, pages 5-6, 289, Harvard University Press, 2008 ISBN 0674033906. ↑ "The Telegraph – Calcutta (Kolkata) | Frontpage | Third cable cut, but India's safe". Telegraphindia.com. 2008-02-03. Retrieved 2010-04-25. ↑ "History of Canada-Australia Relations". Government of Canada. Retrieved 2014-07-28. ↑ "The Commercial Pacific Cable Company". atlantic-cable.com. Atlantic Cable. Retrieved September 24, 2016. ↑ "Milestones:TPC-1 Transpacific Cable System, 1964". ethw.org. Engineering and Technology History WIKI. Retrieved September 24, 2016. ↑ "Learn About Submarine Cables". 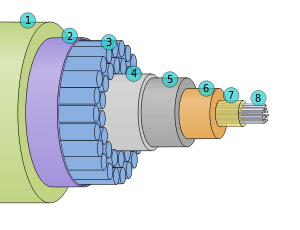 International Submarine Cable Protection Committee. . From this page: In 1966, after ten years of service, the 1608 tubes in the repeaters had not suffered a single failure. In fact, after more than 100 million tube-hours over all, AT&T undersea repeaters were without failure. ↑ "Submarine Cable Networks – Hibernia Atlantic Trials the First 100G Transatlantic". Submarinenetworks.com. Retrieved 2012-08-15. ↑ "Light Reading Europe – Optical Networking – Hibernia Offers Cross-Atlantic 40G – Telecom News Wire". Lightreading.com. Retrieved 2012-08-15. ↑ "Great Circle Mapper". Gcmap.com. Retrieved 2012-08-15. ↑ Gardiner, Bryan (2008-02-25). "Google's Submarine Cable Plans Get Official" (PDF). Wired. ↑ Lindstrom, A. (1999, January 1). Taming the terrors of the deep. America's Network, 103(1), 5-16. ↑ McCarthy, Diane (2009-07-27). "Cable makes big promises for African Internet". CNN. ↑ Tanner, John C. (1 June 2001). "2,000 Meters Under the Sea". America's Network. bnet.com. Retrieved 9 August 2009. ↑ Shapiro, S., Murray, J.G., Gleason, R.F., Barnes, S.R., Eales, B.A., & Woodward, P.R. (1987). 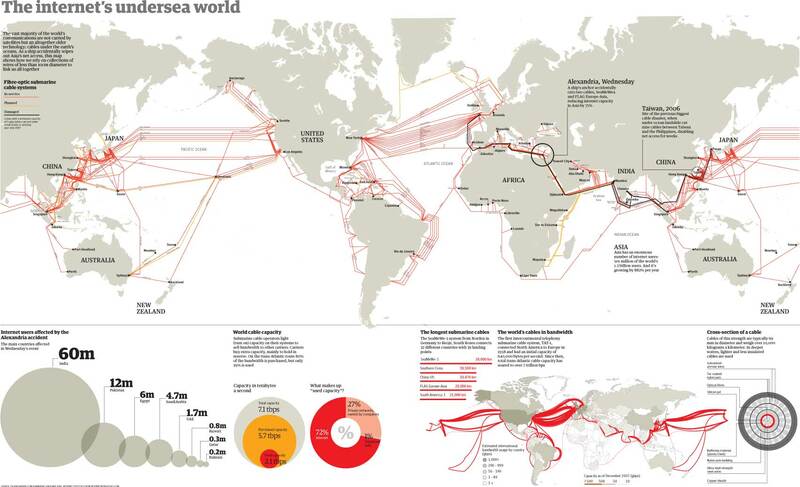 Threats to submarine cables. ↑ John Borland (February 5, 2008). "Analyzing the Internet Collapse: Multiple fiber cuts to undersea cables show the fragility of the Internet at its choke points.". Technology Review. ↑ Fine, I. V.; Rabinovich, A. B.; Bornhold, B. D.; Thomson, R. E.; Kulikov, E. A. (2005). "The Grand Banks landslide-generated tsunami of November 18, 1929: preliminary analysis and numerical modeling" (PDF). Marine Geology. Elsevier. 215 (1–2): 45–47. doi:10.1016/j.margeo.2004.11.007. ↑ "Top Story: Standby Net arrangements terminated in Pakistan". Pakistan Times. Retrieved 2010-04-25. ↑ "Communication breakdown in Pakistan – Breaking – Technology". The Sydney Morning Herald. 2005-06-29. Retrieved 2010-04-25. ↑ "Vietnam's submarine cable 'lost' and 'found' at LIRNEasia". Lirneasia.net. Retrieved 2010-04-25. ↑ "Finger-thin undersea cables tie world together – Internet – MSNBC.com". MSNBC. 2008-01-31. Retrieved 2010-04-25. ↑ "AsiaMedia :: Bangladesh: Submarine cable snapped in Egypt". Asiamedia.ucla.edu. 2008-01-31. Retrieved 2010-04-25. ↑ PT (2011-03-14). "In Japan, Many Undersea Cables Are Damaged". gigaom. Retrieved 2011-03-16. ↑ Kirk, Jeremy (2013-03-27). Sabotage suspected in Egypt submarine cable cut. ComputerWorld, 27 March 2013. Retrieved from http://www.computerworld.com/s/article/9237946/Sabotage_suspected_in_Egypt_submarine_cable_cut. ↑ Grubb, Ben (2014-12-02). "Internet a bit slow today? Here's why". Retrieved 2016-09-11.